The Snorecorder determines and records snore events and functions in two modes, “trigger” and “continuous”; Trigger mode logs a value of maximum snore intensity and its time stamp for a single snore event, and continuous mode records everything (snores and all) at a rate of around 500Hz, which was the fastest rate we could reliably write to the SD card. Snores are determined by checking a scaled accumulator variable of many analog samples and relating its value to a user-chosen threshold.The snore data is saved as a CSV file to an SD card which can be easily viewed in Excel on a personal computer. 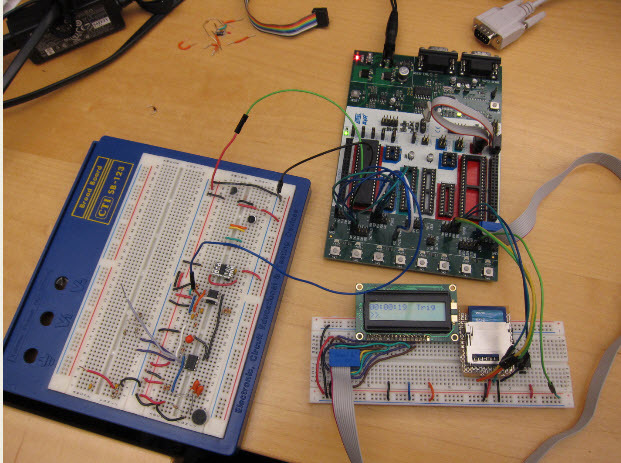 This report contains circuit diagram, microcontroller programming etc.